The third audiobook in The Lost Years of Merlin series finds Merlin facing his greatest challenge yet in order to save the realm. Long ago on the magical island of Fincayra, the last emperor of the dragons took revenge against the realm for the slaughter of his mate and their only offspring. 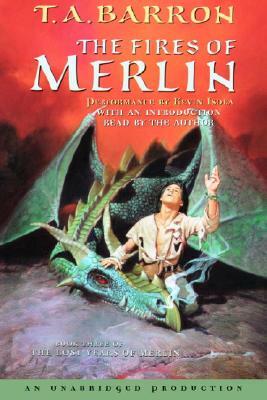 Merlin's grandfather--a mighty wizard--saved the land by casting a sleeping spell over the dragon. The dragon called Wings of Fire has awakened from his enchanted slumber. Prophecy dictates that only the descendant of the wizard who first defeated the dragon possesses the power to stop him. Before Merlin can go to battle, he must conquer his own fears by confronting the sorceress who has stolen his magical talisman--a talisman needed to stop Wings of Fire. But according to the prophecy, the one who destroys the dragon must also die . . .